THE Traditional Chef’s Speciality Smoked Farm Chicken takes the spotlight in the Lunar New Year menu at Si Chuan Dou Hua Restaurant, Parkroyal Kuala Lumpur, this year. “Our Smoked Farm Chicken is unique as the chicken is smoked with Tie Guan Yin tea leaves (also known as Iron Buddha),” said Chinese sous chef HL Sim, adding that the dish typically incorporates duck, not chicken. 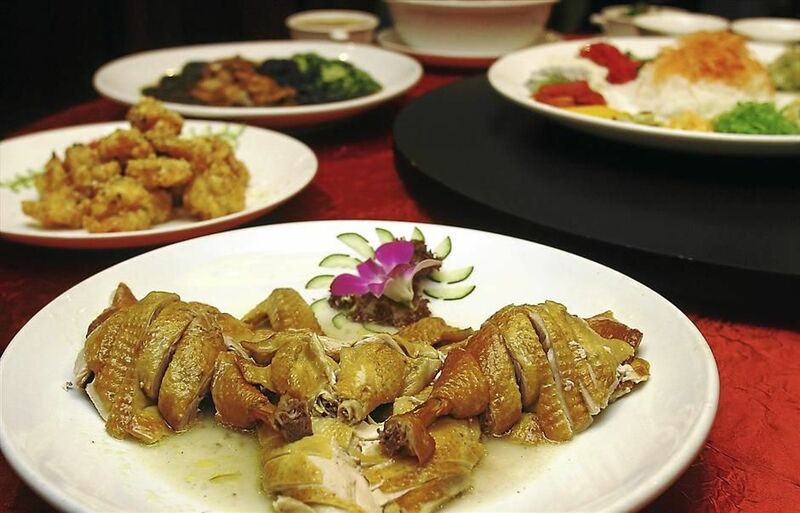 “The chicken is also lightly marinated with salt before the smoking process,” said Sim, who was part of the team that worked on the dish with Chinese chef Donald Chan. Tie Guan Yin tea is one of the best-known varieties of oolong tea, and is touted to aid weight loss and prevent heart disease. Another highlight dish is the Deep-Fried Cod Fish with Pomelo Sauce. Sim said the fish is accompanied with a sauce made from lemongrass, plum sauce, pomelo, lime juice, fish sauce, sugar and bird’s eye chilli, thus creating a tangy, spicy yet balanced flavour. The restaurant also offers Sichuan-influenced dishes such as Sichuan Dan Dan Noodles with Scallop, Sichuan Style Braised Egg Noodles with Chicken and Eggplant, and Braised Sichuan Hot and Sour Shark’s Fin Soup. 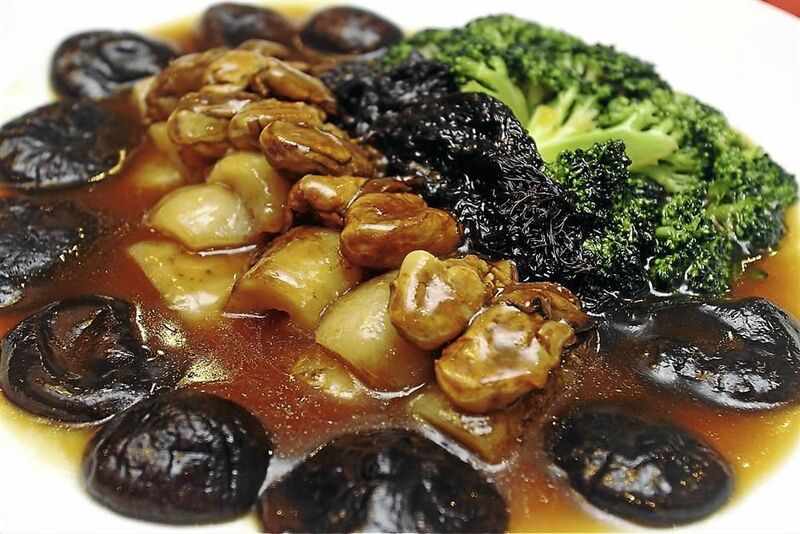 Braised Sea Cucumber , Black Mushroom, Dry Oyster and Black Moss in Garden Green. Chan and his team have put together a bountiful feast of six set menus, with each menu crafted to include symbolic dishes uch as prawn, black moss (fatt choy) and fish. The dishes include Braised Sea Cucumber, Black Mushroom, Dry Oyster and Black Moss in Garden Green, Baked Cod Fish with Chinese Herbs, Steamed Bamboo Fish with Superior Soy Sauce, Stir-Fried Sichuan Style Freshwater Prawns with Garlic and Chilli Sauce, Sauteed Fresh Water Prawns with Butter and Corn Flakes, and Braised Coral Shark’s Fin with Crab Meat, Bamboo Piths and Dry Scallop. Diners can toss to a prosperous year ahead with the restaurant’s refreshing Tropical Fruits Yee Sang, which consists of sliced kiwi, dragon fruit, mango, strawberry and rock melon. For those who prefer having seafood yee sang, they can take their pick from ingredients such as abalone, tuna, salmon, soft shell crab, jellyfish or Pacific clam. The different varieties of yee sang is served with specially concocted sauces like Sour Plum Sauce enhanced with fruit flavour, Spicy Plum Sauce with Mango, or the traditional Plum Sauce. For sweet endings, the meal ends with desserts like Steamed “Nian Gao” with Coconut Flakes, Sweetened Water Chestnut with White Fungus, or Homemade Fine Beancurd with Wolfberries. Si Chuan Dou Hua’s Lunar New Year menu is available from Jan 13 to Feb 14, for both lunch and dinner. The yee sang is priced from RM56 nett (half portion) and RM103 nett (full portion) onwards. The set menus cater for two, or four, six or 10 persons. The Happy and Prosperous set is priced at RM750 nett per table of four persons while the Smiles of Fortune set is priced at RM1,088 nett per table of six persons. A group of 10 persons may opt for the Golden Prosperity set at RM1,958 nett or the Bountiful Wealth set at RM2,300 nett. Meanwhile, Chatz Brasserie will be offering a high-tea featuring Malaysian cuisine on Jan 31 and Feb 1. It is priced at RM68 nett per person, and is available from 12.30pm to 4pm.